The Oconee County Industrial Development Authority went into executive session Monday to discuss real estate matters, less than two months after the Authority learned that its latest attempt to sell part of its Gateway Technology Business Park had fallen through. The session lasted 40 minutes, and the Authority took no action when it came back into open meeting. J.R. Charles, the county’s economic development director, said yesterday (Tuesday) that there are no plans to hold a called meeting before the next scheduled meeting of the IDA on June 12. Authority Chair Rick Waller provided no specifics about the topics to be covered in the executive session, but the only property the Authority is marketing is in the Gateway Technology Business Park on SR 316 on the southern edge of Bogart. County Attorney Daniel Haygood was at the IDA meeting and joined in the executive session. The Gateway Technology Business Park occupies much of the discussion at IDA meetings, and the meeting on Monday was no exception. Waller told the group in his Chair’s Report that he anticipates needing to spend about $10,000 clearing the western parcel of the property of trees and brush. The authority is considering putting herbicide on the land once it is cleared to lower costs of future maintenance of the site. Waller said he wants to wait to see if the county would be willing to do the maintenance before getting final approval to spend the money. 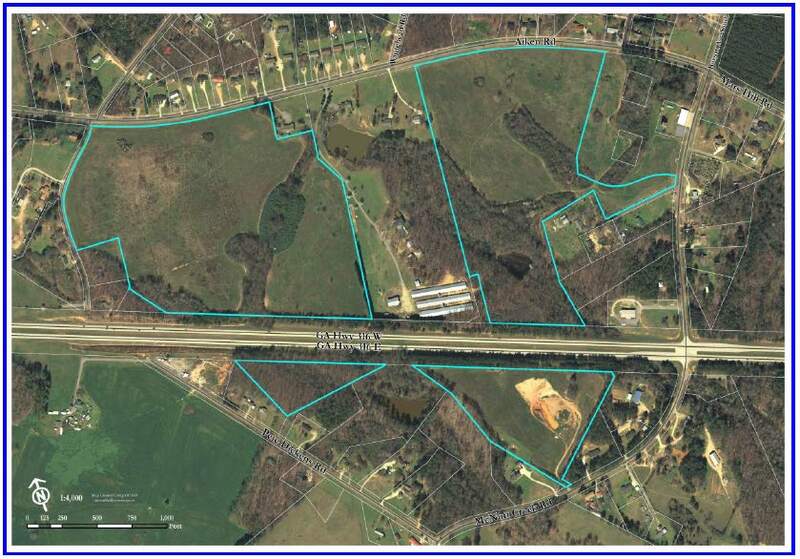 The Authority has owned the roughly 100 acres that make up the business park since 2000. The property is split into four noncontiguous parcels, two small ones south of SR 316 and two large ones north of the highway. The two larger tracts are separated by acreage that the Authority has tried, without success, to purchase. Clyde Armory at one point expressed interest in the two southern parcels, but that interest has fallen through. Alexion Pharma of New Haven, Conn., purchased 11 acres in the eastern parcel of the business park in late 2016 for a pharmaceutical production and research operation. So far, that is the only successful sale of land in the business park. Alexion had signed a purchase agreement on Dec. 19 of last year for the remaining 38 acres in the eastern parcel of the business park after the IDA held two closed door meetings to work out details of that contract. Nutter and Associates Environmental Consultants prepared a report for Alexion on Jan. 16 of this year that identified significant wetlands on the site, including an active beaver dam. The contract Alexion signed with the IDA had left unspecified the total acreage to be purchased pending identification of wetlands. Alexion could come back with a different offer for only the northern part of the site, which does not include the wetlands. The total acreage in the four parcels is not firmly fixed, and county promotional materials on the county web site use differing figures. The Authority on Monday approved a budget to spend $152,520 this coming fiscal year. Revenue for the balanced budget comes largely from rent the Authority receives on the U.S. Post Office in Watkinsville. The Board of Commissioners has agreed to allow the Authority to have the $9,460 monthly rental from the facility to spend as it sees fit. Wes Geddings, Oconee County finance director, reported that the Authority is sitting on $2.6 million, though $1.8 million of that is in money borrowed by the Authority to pay for construction of Parkway Boulevard Extension and beautification of that roadway and Mars Hill Road. The video of the IDA meeting, held at the Chamber of Commerce on Nancy Street in Watkinsville, is below. OCO: IDA 5 8 17 from Lee Becker on Vimeo. It must be assumed that the land purchase was made for selling. Now it seems that those interested in buying do not. Whatever the reasons for failing to make it happen, something's gotta be fixed. Perhaps it is the approach. They vegetation management stopped abruptly 2 months ago. They had started clearing down the second parcel and then stopped, took all their toys and went home. We never knew why. My guess for it not selling is that they cannot get the owners between the two properties to sell so that it can be one contiguous parcel. It would be much more viable to them if they could go corner to corner rather than try to sell two distinct parts. Mr. Becker, is the land clearing subject to the same ordinance(s) applied to Briarwood Baptist's clearing & another concern having a 3-yr wait for breaking it? Please correct my citing from topical remembrance if off. I am not sure I understand your question. The IDA is describing what it is doing as bush hogging the property. I'll let you know if they restart Lee. 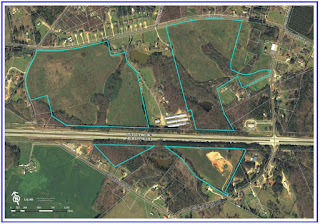 So for the past 17 years, the Oconee County Industrial Development Authority has one, just one, successful sale of land in the business park it owns. "Oconee County Industrial Development Authority Seeks Advice from Board of Commissioners"